The island of Cyprus is situated in the far east of the Mediterranean Sea. It has no deep-rooted tradition of gardening for pleasure and consequently possesses no major gardens. 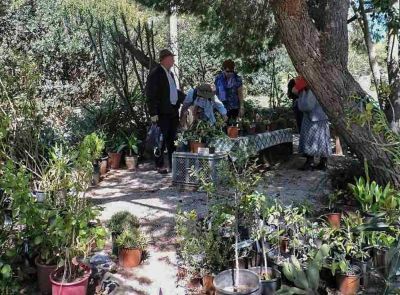 The culture of subsistence growing that has prevailed for centuries is gradually being eroded and replaced as ‘garden centres’ and nurseries become more numerous and ambitious with regard to the selection of plants they offer. However, as a consequence of this the need for education and guidance, especially when it involves the question of water and its conservation, has become a major issue. This is an issue that the members of the Cyprus Branch are attempting to address, using a variety of means at their disposal. The photo at the top of this page shows an area of the Troodos Botanical Garden ‘AG Leventis’ created by the Cyprus Forestry Department on the site of an abandoned asbestos mine. Asbestos was mined commercially in Cyprus from 1904 to 1988, by which time the growing realization of its dangers to human health rendered its production less and less financially viable. During those 80 years over 300 hectares of forest had been destroyed leaving a barren, sterile landscape. In 1995 the Forestry Department began a massive reforestation effort that is still ongoing. Part of the initial plan was to eventually incorporate a Botanical Garden into the project and enough funding was found for work on this to be started in 2005. The Cyprus Branch of the MGS has been involved with the project from the outset. Branch Head John Joynes writes: "While I was born and grew up in Derbyshire, England, my working life took me to a variety of locations in the UK, along with periods spent in Singapore, West Berlin and Cyprus. In 1997 my wife and I returned to Cyprus to take up permanent residence in the house we had built in 1988 on land we had acquired in 1968. This was when we seriously began to make up for lost time, horticulturally speaking, and we have continued to learn on a daily basis ever since." Please contact John to find out more. For previous reports and articles please check out the archived (non-responsive) Cyprus Branch page. This trip was undertaken by 19 members of a combined MGS (Cyprus Branch) and Cyprus Third Age (Gardening Group) excursion. The morning of Day 1 was dedicated to the historical aspect of Ancient Athens. 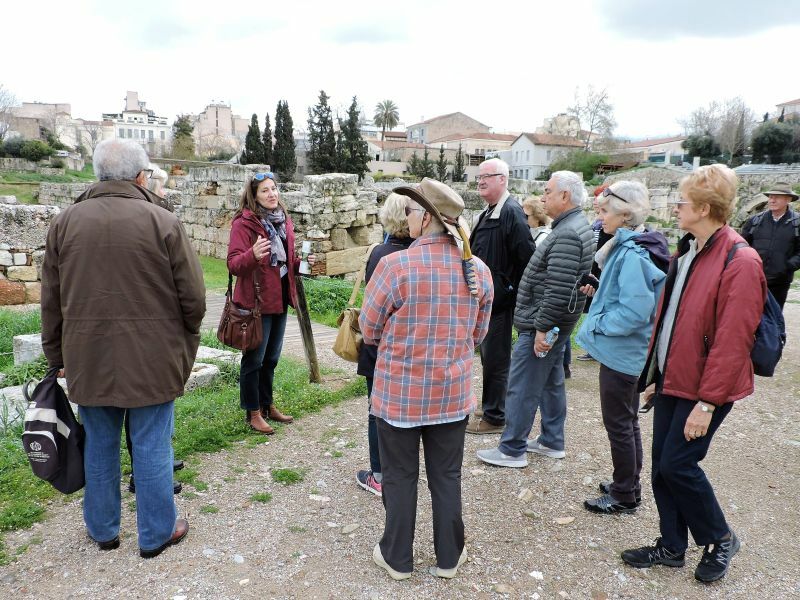 A guided tour of the Kerameikos archeological site was followed by one of the new Acropolis Museum. The afternoon had more of a modern slant with a visit to the Stavros Niarchos Foundation Cultural Centre, home of the National Theatre and National Library, with its enormous roof garden. Day 2 saw us in the MGS garden, Sparoza, the main attraction of the whole trip. The garden had put on a specially welcoming display, matched only by that of the custodian, Sally Razelou, assisted by Fleur Pavlidis and Claire Abery. The small nursery provided some members with the first of the many plants they were to acquire in the course of the next few days. From Sparoza we headed to Marathon for a quick look at the Museum, dedicated to finds from the area, before moving on to the nursery of Ioannis Gryllis. Here we were treated to a comprehensive tour of the extensive plant collection, some of which were added to those obtained earlier in the day, followed by an invitation to partake of an equally extensive selection of refreshments provided by Ioannis’ mother. On Day 3 we visited the Diomedes Botanical Garden. 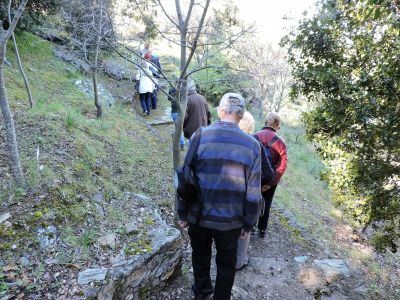 Its arboretum and gardens proved to be larger than expected, consequently not enough time had been allocated in order to appreciate them fully before we had to leave and head for our next port of call, the suburb of Kifissia. Here we were to meet our guide for a tour of the Goulandris Natural History Museum and associated GAEA Centre. Another Botanical Garden was on the agenda for Day 4 of our tour, the Philodassiki situated on the flanks of Mt Hymettos. Their small nursery was also raided for yet more plants to add to the growing collections. In the afternoon, we set off along the scenic coastal road to the southernmost tip of the Attic peninsular and Cape Sounion. 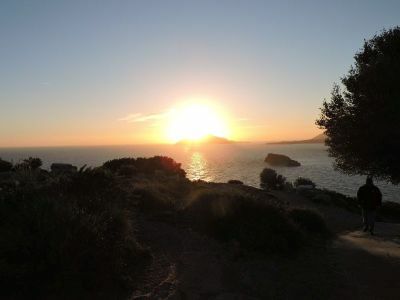 Here we were to view the sun setting over the Aegean Sea from the site of the Temple of Poseidon. Unfortunately, the sun was also setting on our excursion as we were due to return home on the morrow. Everyone had pleasant memories to take with them while some also had suitcases full of newly acquired plants.